The boat LEADER is based out of Racine during this time period for the fast paced Coho Salmon action. April tends to be great for Brown Trout and the start of Coho Salmon. We also see some Steelhead and the occasional Chinook (King) Salmon are part of the daily catch. Many limit catches are expected during this period. If you are looking for that Trophy Brown Trout this is a great month for you as we take lots of Browns over 20 lbs!! May usually produces the fastest fishing of the year for Coho Salmon. We tend to get limit catches of Coho Salmon during this season. More Chinook Salmon and Lake Trout and Steelhead are included in the daily catch. 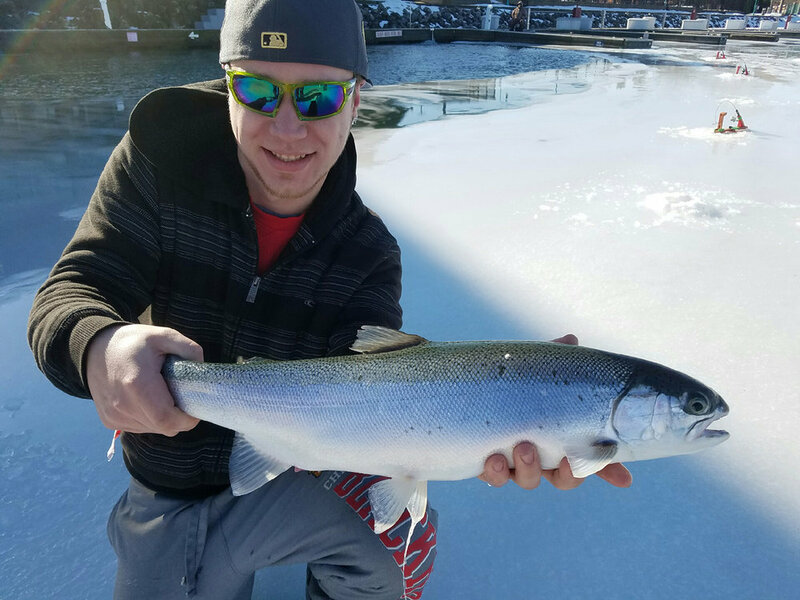 June is one of the best months for great catches of large Coho Salmon and Steelhead with numerous Chinook Salmon and Lake Trout in the catch. The boat LEADER is based out of Milwaukee during this period for the fast paced action of Chinook Salmon. More Chinook Salmon are caught out of Milwaukee than any other port in Southeastern Wisconsin. We also choose Milwaukee because of the proximity to the Mid-lake reef complex of Lake Michigan. This area is a holding ground for Steelhead and Lake Trout. July is a great time for a good mixed bag of all of the species and also very consistent action. Some of the best Chinook Salmon fishing on Lake Michigan occurs in Milwaukee during July. This is also an amazing time to get that Trophy Steelhead on the longer 8 hour trips as we are often 15 miles or more off-shore. Impressive Lake Trout are also very common during this charter fishing season. August is still a great time for Trophy Steelhead on the 8 hour trips. Mid to late August is one of the best times for a Trophy Chinook Salmon, which can range up to 30 lbs!! Many fishing charters in August are limit catches filling the cooler very fast because of how large the fish are. September is the month that the Chinook Salmon move in close to shore in and around the harbor gaps as they are getting ready to spawn in the shallow water. If you are looking for a massive Chinook with an epic battle we will most likely fish close to these gaps. This is also a great time for the other species and non-mature Chinooks in deeper water. October is a great month for very quick Brown Trout action. Near shore Milwaukee waters begin to cool quickly drawing in active Brown Trout and younger Chinook Salmon. Fishing charters can be fast and furious at this time of year with the fish preparing for the cold Lake Michigan waters during the winter. November is the month that we fish in Bay de Noc Michigan for Trophy Walleye and Huge Smallmouth Bass out of the 21ft 2018 Ranger. These are destination trips as we travel and stay in Michigan for the month as well. Book your trip early to get in on this crazy action. Come fish with our Captains in the upper Peninsula of Michigan’s Little and Big Bay de Noc, for the trip of a lifetime. The upper Peninsula of Michigan is well known for the gorgeous waterfront and World Class Trophy Walleye and Smallmouth Bass fishing. Our captains have been fishing Little Bay de Noc since 1998. Our boat is fully licensed and insured as well as inspected according to the laws of the state of Michigan. Of course, safety is our number one concern and our goal is to share our knowledge and provide an excellent experience for a fun-filled, successful trip. We use a 21 foot 2018 Ranger outfitted with Raymarine electronics, a Raymarine Autopilot, 36v Minnkota Ulterra trolling motor, and Mercury Outboards. We provide all of the rods, reels and tackle that you will need for your fishing trip using top of the line Shimano rods and reels and literally thousands of baits. 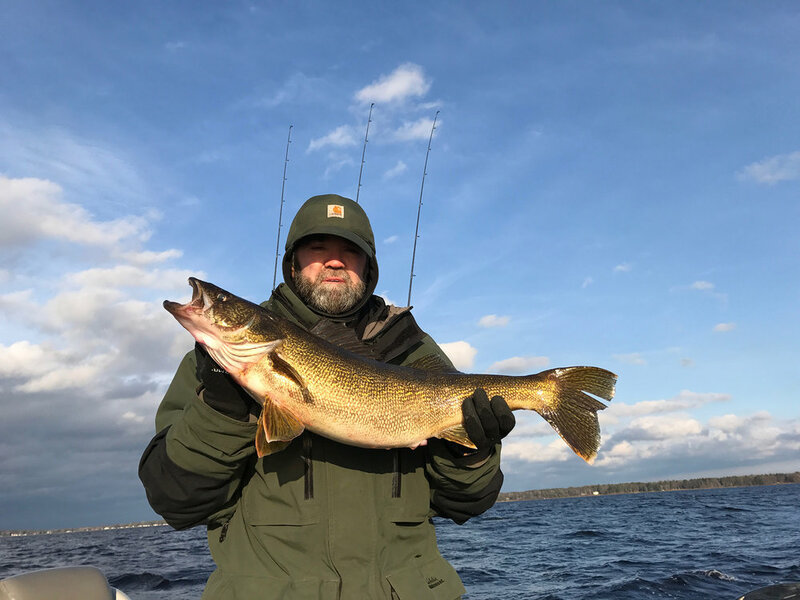 We charter for Huge Walleye the entire month of November on Little Bay de Noc, which is the Northwest most point of Lake Michigan out of Gladstone Michigan. Fishing is done in the deep-water areas of rocky reefs with amazing bottom structure and also shallow water next to the weed lines. We typically do this by trolling crank baits or live baiting with sucker minnows or chubs. Little Bay de Noc holds some of the largest walleyes of the entire Lake Michigan fishery. The smaller fish are excellent eating but you have a great chance of a Trophy Walleye, many between 8-12 pounds. Most days you should end up with your limit of Walleye to take home!!! We also target Smallmouth Bass during the day and many days we catch more than 30+ fish. These fish are trophy size Smallmouth Bass with many of them between 20 and 22 inches, with some even larger!! You can find large Smallmouth bass in many places around the United States, but Lake Michigan is listed as one of the top 7 places to catch Huge Smallmouths. Within this Lake Michigan fishery for Smallmouth Bass the majority of the Huge fish come from Green Bay Wisconsin North to Little and Big Bay de Noc. Smallmouth bass are by far one of the most entertaining species of sport fish to catch, and pound-for-pound some of the strongest fish. December is an excellent time for a guided river trip for World Class Brown Trout and Huge Steelhead. The Brown Trout and Steelhead make their way to the rivers and Marinas as they are getting ready to spawn during the Winter. January is when we normally get the ice that we need in the harbors and marinas for our guided ice fishing trips. We catch some of our largest Brown Trout and Steelhead in January. The Brown Trout that we catch in Milwaukee and Racine are World Class Trophy fish that people travel from around the World to catch. February continues with the guided ice fishing trips for Massive Brown Trout and Steelhead. If the rivers open up in late February we will start the guided river trips for these same fish as they are getting ready to spawn. March is a transitional month depending on the temperatures. Late guided ice fishing trips can be amazing for Huge Brown Trout and Steelhead. We are also catching these amazing fish in the rivers as well when the ice goes out.